Stating the obvious, but for the uninitiated, a wallpaper is the background image on the home screen on your Android phone or tablet. And it can be changed as needed, which is great, since the default Android wallpapers that come bundled with most Android devices are just plain boring. The method to change wallpaper on Android device is same for all devices irrespective of whether you are using an Android smartphone or a tablet. Here’s the procedure. Press menu on the home screen of your Android device and select Wallpapers option. You can also press and hold any empty space on the home screen to open the wallpaper settings on Android. 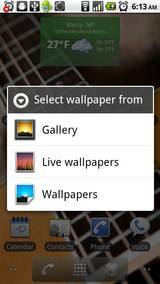 You will have multiple choices in the wallpaper settings depending upon your Android device. These will be, Gallery, Live Wallpapers and Wallpapers. Tap on ‘Gallery’ if you wish to set any image from your Android device as a wallpaper. Select ‘Live Wallpapers’ if you wish to apply a live wallpaper. And finally, select ‘Wallpaper’ option if you wish to use one of the factory installed wallpapers on your Android device. For the ‘Gallery’ and ‘Wallpaper’ options, once you select the image that you want to set as a wallpaper, a window will appear which will let you choose which part of the image you want to use for the wallpaper. Once you crop the wallpaper to select the desired part of the image, click Apply to set the image as the wallpaper on your Android device. If you select the ‘Live Wallpaper’ option, most of the times, the live wallpaper will be instantly applied on your home screen. Some Android live wallpapers may also ask you for some settings which you can define as/if needed. Note that once you tap on ‘Apply’ wait for a second to see a confirmation that the wallpaper has been changed on your Android device. If you click on the home button too soon, before the wallpaper is applied, you may have to repeat the whole procedure again. Hope you’ll be able to change the wallpaper on Android easily now. Do check out our comprehensive collection of Android wallpapers!